Sensory Processing Disorder means that a child perceives and interprets information from the senses in a different way. It is a neurological disorder that affects the seven senses: proprioception, vestibular, vision, hearing, tactile, gustatory, and auditory. Each child usually has one or two senses that are more affected than others. Just to clarify, Sensory Processing Disorder is not a dysfunction at the site of sense, for example burst eardrum causing hearing loss. Instead it is a disturbance in the processing of information in the nervous system as it reaches the brain. 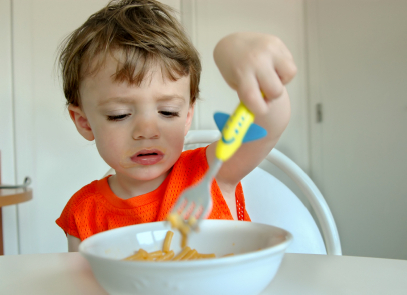 Some children are particularly affected by the gustatory and tactile senses, which has a huge effect on eating. Certain textures or tastes can be very uncomfortable/difficult for their brain to process. However, there are ways to manage this so the child can still eat a variety of textures and tastes. Grind food so it is smooth to eat without large lumpy bits. This means there is less information for the brain to process. Get the child involved in the preparation of the food. This will make the child feel more comfortable with the food and excited to try something new because he/she made it. Create a system of trying new foods. Try not to introduce too many types of new tastes and textures all at once. It may be helpful to write it on a calendar for each week/month trying one type of new food. Use positive reinforcement such as a star chart, and praise the child when he/she tries something new.